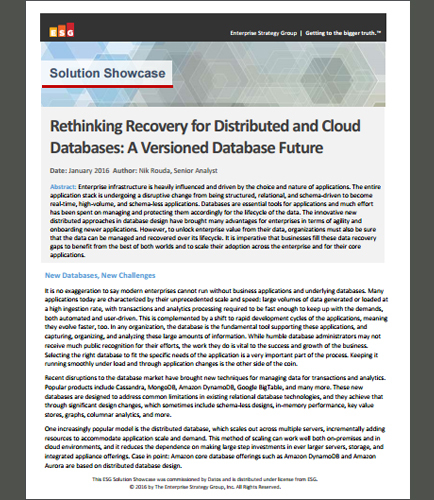 "Recovery for Distributed and Cloud Databases Problems"
Enterprise-grade recovery capabilities for distributed and cloud databases is a necessity. It is no exaggeration to say modern enterprises cannot run without business applications and underlying databases. To unlock enterprise value from their data, organizations must be sure that the data can be managed and recovered over its lifecycle. It is imperative that businesses fill these data recovery gaps to benefit from the best of both worlds and to scale their adoption across the enterprise and for their core applications. Knowing more about the perfect platform, which is rethinking recovery for the world of scale-out databases, is a requirement. What are some most common distributed database recovery issues? What are some best traditional database recovery techniques that are out in market? What are the trends that will shape application and infrastructure availability? What is the exact criteria for selecting the right database management system? What are the data warehouse disruptions in the database market? What are the major database-centric backup/recovery problems? How can you manage data for transactions and analytics? This whitepaper lays out five steps towards distributed database design to ensure your project matches up with requirements from inception, through the development life cycle and to deployment. To handle the data protection requirements of this new generation of real-time applications, enterprises are increasingly turning to data protection software for distributed and cloud databases. Data protection software provides automated, scalable, consistent and reliable recovery for big data and cloud environments. What are the new data protection requirements for cloud database security? How this fundamental shift raises the critical issues in the lifecycle of data management? This informative whitepaper brings you the key benefits of using Data Protection software: Scalable Versioning Reliable Recovery Semantic De-duplication Scale-out Software In this whitepaper, we will review different challenges for data storage security and privacy protection in the cloud computing environment. Backups, Tiering, And Archiving: Do I Need Them All? Each one of backups, tiering and archiving addresses different aspects of a complete data management solution. Together they address legal, regulatory, information security, and economic concerns. What are the software tools available to address the complications faced in data backup and recovery? The purpose of this white paper is to help you understand how backups, tiering, and archiving technologies differ and how they work together to fight against data loss and meet your business needs in a cost effective manner. Backups offer protection against data loss by providing the means to restore your data after a hardware failure or some other data loss event. Tiering is a strategy for managing the cost of file data. By identifying unused or seldom used files and handling them accordingly, significant saving can be realized. Archiving is necessary for regulatory compliance, provides inexpensive long-term file storage and, if implemented correctly, offers a means of retrieving individual files. Read this White Paper to Dig Deeper on ! What is Cloud Backup ? Cloud backup is the ability to save and restore data from a remote, cloud-based server provided by a third-party service provider. The data on cloud backup can be remotely accessed from multiple resources. Generally, data is encrypted thus offering secured off-site storage. Cloud backup is also known as online backup or remote backup.